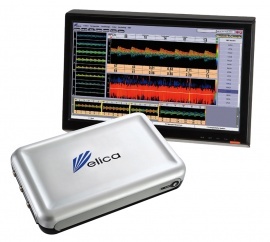 Diagnostic TCD - Delica Transcranial Ultrasound Doppler - Products - SMT medical GmbH & Co. The Delica EMS-9UA system is the perfect neurovascular testing solution in your office, hospital lab or bedside applications. Newly designed 1.6 MHz probes offer improved bone penetration and unparalleled signal quality, allowing faster and more efficient extra- and transcranial insonations. User programmable protocols with save-next function by remote control or foot switch allow flexible one click adaptation to each clinical situation. Paperless reporting and optional DICOM interface enhance seamless integration into work environments and clinical needs. Each insonation can be viewed in up to eight depths simultaneously, yielding spectra of unequaled clarity. The M-Mode display offers additional information along the beam. Lesions can be located easier, earlier and with better spacial resolution. Save and analyze vessel insonations in all depths, and even switch depths retrospectively. Delica EMS-9UA features high resolution display and documentation of highest and lowest flow velocities alike. In addition to all practical advancements and innovations, the Delica TCD system means an economical and technically safe solution to the user. 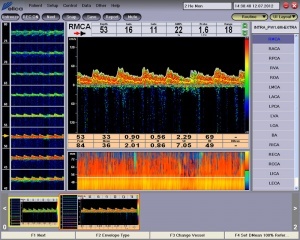 As the Doppler technology is housed in a small and lightweight module, USB-connected to a PC or notebook, the TCD system will stay up-to-date independent from possibly aging, yet inexpensive PC technology, which will make your TCD investment safe for future adaptations. Featuring an intuitive user-interface and countless user specific configurations, the MS Windows® based Delica TCD software offers seamless integration with hospital or office IT systems. The compact Delica instrument series guaranties unprecedented reliability. Nevertheless, you can count on our competent technical support and methodological expertise in TCD, acquired during the past 30 years.